Anthony Woodburn deals in fine antique clocks - 17th & 18th century English antique bracket clocks, longcase clocks and antique barometers, including pieces by ROBERT HODGKIN, London. 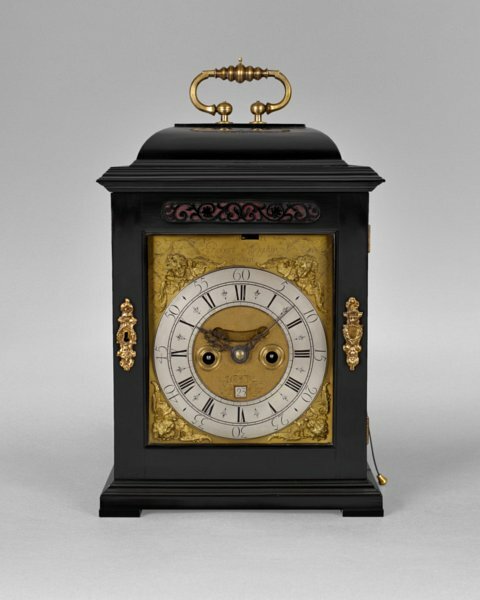 A good, William & Mary, ebony veneered, quarter repeating spring table clock. The ebony case standing on block feet with a single, well-patinated brass carrying handle to the caddy top. The 7ins x 8ins elongated brass dial is mounted with a silvered chapter ring and winged cherub spandrels. The upper corner spandrels have peripheral foliage engraving flanking the maker’s signature. The matted centre has an aperture to view a false pendulum, a second aperture to view the day of the month and ringed winding holes. The twin fusee, eight day duration movement has a verge escapement and quarter repeating mechanism sounded on three bells with the hours on a separate bell. The backplate, decorated with birds and flowers, has peripheral wheat ear engraving and is signed by the maker, Robert Hodgkin, London.